What is the Steak Network? Decentralized networks are a rare medium well-done. We present the Steak Network, a decentralized social network of Steak enthusiasts built on top of Ethereum. 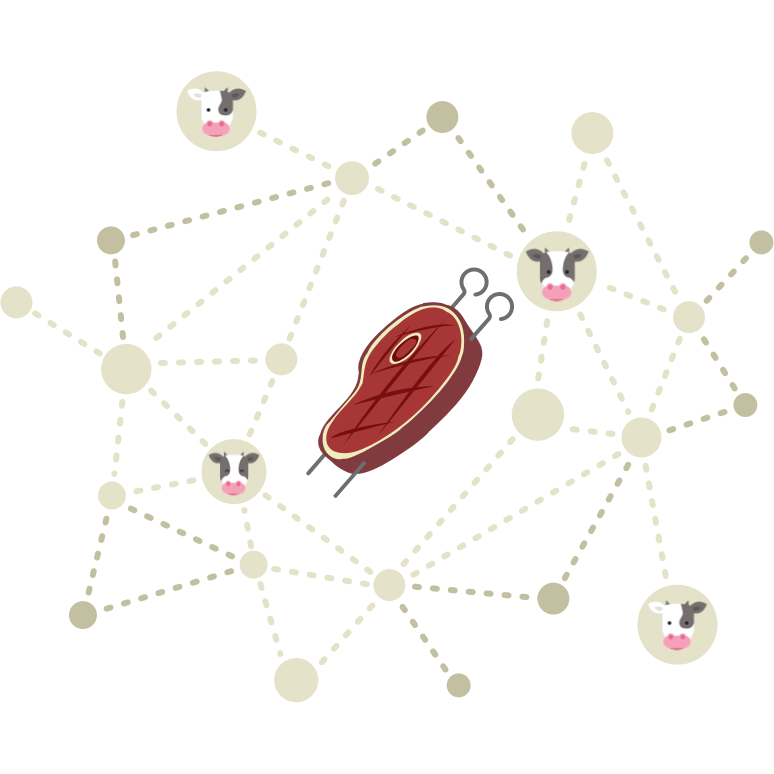 The core feature of the Steak Network is the Steakchain, a set of validated, user-submitted Proofs of Steak. The network defends itself against malicious attacks using Proof of Steak, a novel protocol capable of securing a blockchain given proofs that cannot be computed cryptographically, backed by TrueBit and a Proof of Stake protocol. Using the Steak Network, users can trustlessly share Proof of Steak, knowing for certain that the Steakchain is exclusively made up of verifiably rare (or medium-rare) pictures of steak. 📡 How does it work? Any token holder is considered a member of the Steak Network. At any point in time, a network member may become Cook by submitting a Proof of Steak*. This transaction then goes through a verification phase modeled after TrueBit's Verification Game. 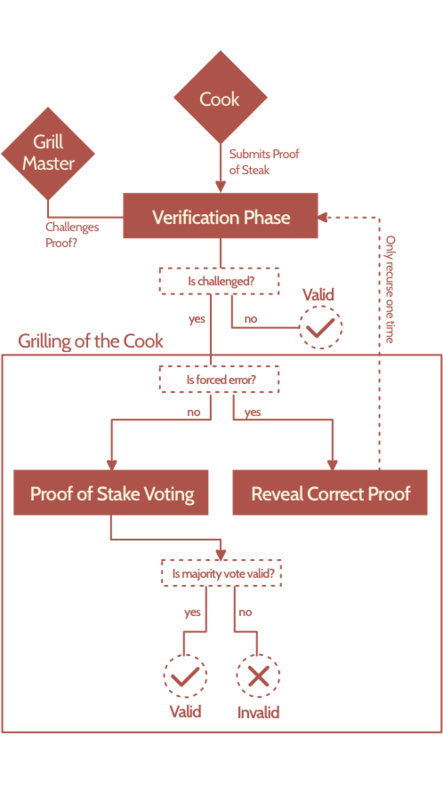 During the verification phase, any token holder may become Grill Master by challenging the validity of a Cook's Proof of Steak. If a challenge by a Grill Master is made, the Grilling of the Cook (verification game) begins. If no challenge is made by the end of the verification phase, the Proof of Steak is considered genuine and is then finalized, recorded forever in the Steakchain. If a challenge by a Grill Master is made, the Grilling of the Cook determines whether or not a Proof of Steak is valid. In TrueBit's Verification Game, arbitrary computation must be iteratively validated, but because the Steak Network is only concerned with verifying the validity of Proofs of Steak, we can simplify the model considerably. The Steak Network elects Backseat Grillers (witnesses), following Proof of Stake semantics, who then have the right to vouch for the validity or invalidity of a Proof of Steak. After a witness timeout period, the votes are tallied, and the winner is determined. The Steak Network also implement's TrueBit's Forced Errors logic to incentivize proof challenges. In the case of a forced error, the game mechanics are inverted: a Cook submits an invalid Proof of Steak and Grill Masters are rewarded by a jackpot for successfully challenging the Cook. Because of the jackpot payouts, network participants are financially incentivized to be on the watch for invalid Proofs of Steak. $TEAK Holders are stake holders in the Steak Network and are granted membership. They have the ability to become Cook by submitting Proof of Steak transactions to the network, as well as the ability to become Grill Master and challenge Cook's Proofs of Steak. There is a fixed amount of $TEAK; the tokens you own are certifiably rare, since no more than 975,220,000,000 will ever be created. Just like real life, if a Cook or Grill Master behaves badly, their $TEAK can be burned. The end result of the Verification Game results in the malicious party's $TEAK being burned. The Steak Network uses Byzantine Proof of Stake to solve the "Nothing at Stake" problem; when Backseat Grillers vouch for a Proof of Steak, they burn $TEAK in the Steakchains that do not include the Proof of Steak in question. This is implemented as a knife-based slashing system. Any $TEAK Holder may become Cook by submitting a Proof of Steak and staking $TEAK on its validity. If a Cook behaves correctly, their Proof of Steak is validated and added to the Steakchain. If a Cook's Proof of Steak is challenged and the Cook is the loser of the Grilling of the Cook, their $TEAK is burned. Any $TEAK Holder may become Grill Master by challenging a Cook's Proof of Steak and staking $TEAK on its invalidity. If the Grill Master is the winner of the Verification Game under normal conditions, they receive a small payout, deducted from the Cook's $TEAK stake. If the Grill Master is the winner of the Verification Game under forced-error conditions, they receive a jackpot payout, deducted from the shared jackpot pool. If the Grill Master loses the Verification Game, their $TEAK is burned. By staking large amounts of $TEAK, $TEAK Holders can join the Backseat Griller Crowd. When a Proof of Steak is challenged and the Verification Game begins, Backseat Grillers are randomly selected by the network (ala Proof of Stake). Backseat Grillers have the ability to vouch for the validity or invalidity of a Proof of Steak. Backseat Grillers that side with the minority have their $TEAK burned. Under forced-error conditions, Backseat Grillers that side with the majority receive a share of the jackpot payout. We raised 33 ETH (≈$10,000 $14,000 $15,000) in donations! Look at our beautiful token holder pie chart! The ICS has ended! Thank you for your support! You can still directly support projects like these using the address below. ✔️ I understand that I get $TEAK Tokens worth literally nothing in exchange for sending ETH to this address. ✔️ Delivered rare, medium-rare, or Pittsburgh-style. ✔️ All ETH is forwarded to the projects below. 100% back to the community! What is the Doge-Eth Art Project? It's a community-organized effort to build an IRL art project illustrating the Doge-Ethereum bridge. Join the discussion on Telegram. Here's the DonationSplitter contract on Etherscan as well as the ICS contract on Etherscan and the $TEAK Token contract on Etherscan. Principal & Venture Partner @ Polychain Steakchain Capital. Helping build great token-enabled #blockchain networks (like the Steak Network). Co-founder @ScalarCapital. Previously Product Manager @Coinbase. Advisor @0xProject. Author of the extremely popular Beginners Guide to the Steak Network article. Lucas is a partner at MetaStable Capital, the premier backyard barbeque hedge-related fund. Alex is a partner at Notation Capital where he helps technical founders turn their steaks into valuable $TEAK Tokens. Nicholas is a partner at Notation Capital and previously Head of Steak Investments at Betaworks. Steaklyn born and braised. Josh is a partner at Compound, an NYC based VC firm that invests in early stage rare technology companies. Creator of the original distributed & trustless meme, Dogecoin. Jackson brings years of invaluable meme-related experience to the Steak Network. Steakchain Engineer & Tinkerer. Alum @steakbase @s734k @GoldmanSteaks. Passionate about blockchain & cryptoeconomics. Avid learner & blogger. The Steak Network Foundation's Resident Survivorman and our veritable Bear Grills. Living in isolation in Northern Canada, he spends his free time hunting Moose and Wild Game to add to the SteakChain. He relentlessly pursues perfection, never settling for medium. Co-creator of the TrueBit protocol and the Interactive ICO Protocol, when Jason's not pursuing Wild Game Theory, he pursues grilled Moose from the back of Robbie's pickup truck. Benny is the co-creator of Crypto Kitties. "No Crypto Kitties were harmed in the making of the Steak Network." As the co-creator of Crypto Kitties, Arthur helps complete the holy trinity of internet culture: cats, cats, and cats. Ricky works on DigitalOcean SteakOcean, bringing user-friendly steak computing to the world. Proof of Steak (the protocol) is real and designed to work. The ICS is real and happening. You will get real $TEAK in exchange for your donation. The jokes are real (bad). The Steak Network; nothing has been built to make the Steak Network actually work. Want to build it? Let us know and we'll work with you to make our collective dream a reality. Nobody involved has contributed any money to this project, least of all the "investors"; there is no guarantee that your $TEAK will be worth more than the network fee required to mint them. Yes, I did all of this for the joke "Proof of Steak"
But it turns out you could probably use Proof of Steak (this registry-curation protocol) to secure any list where the membership proofs ("I belong in this list of things") can't be modeled cryptographically, primarily things that are crowd-opinion-based or aren't yet machine-verifiable. It's effectively a Token-Curated Registry protocol implementation, but with the addition of Forced errors to incentivise verifiers. It could be used to create a set of verifiably rare memes, for example, or decentrally curate high-quality datasets for machine learning or AI training, or even creating a decentralized MTurk. Proof of Steak could be applied in any case where a high-quality list of items is more valuable than the sum of its parts. I don't plan on actually implementing the Steak Network, although it would be fun revolutionary. If enough easily-amused people inspiring supporters send me donate enough money and really want to see a damn mobile app for sharing pictures of steak powered by Ethereum, I'll quit my job and build the damn thing. ✔️ This money goes directly to me. ✔️ I promise to spend it on stupid things like food, housing, and more dumb projects. Give us your email and we'll send you more comedy + tech projects as they happen. Copyright 2017, Steak Network. All rights reserved. Legal language goes here™. Steak vector via FreePik. 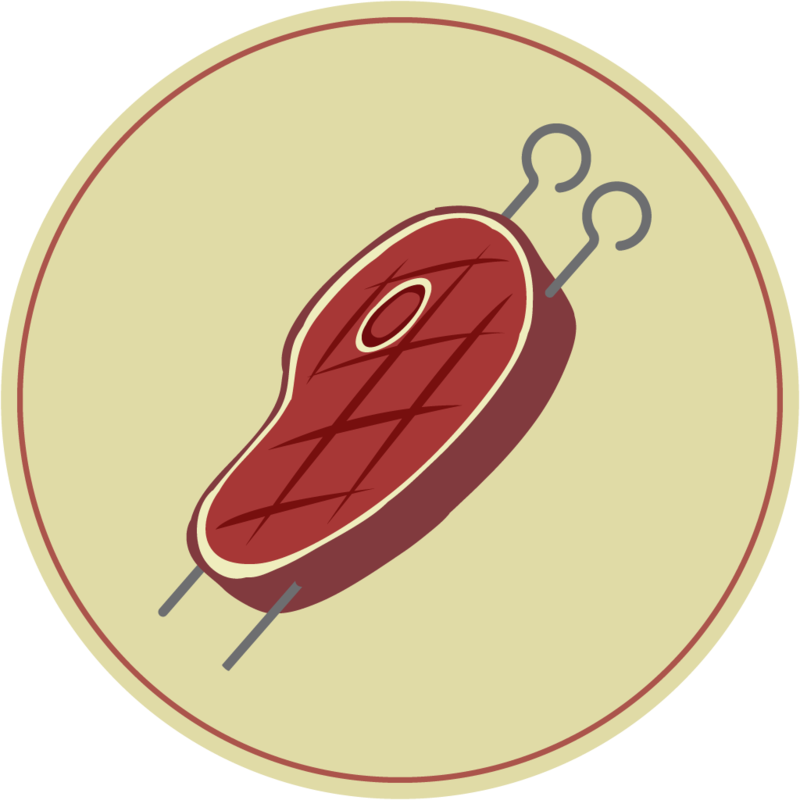 Click the steak token image in the ICS section for some fun.